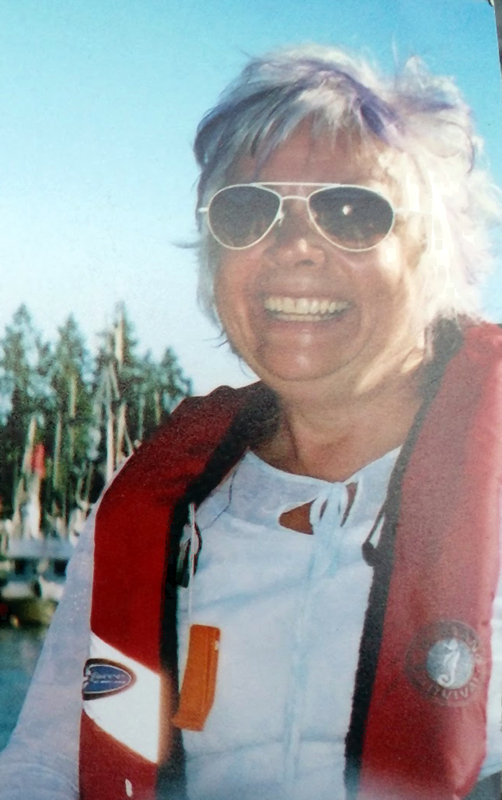 Karen Dawes (nee Whately), age 73, died at home in Vancouver, BC after a brief but intense battle with liver cancer. Karen was born in Toronto to Ralph and Mary (O’Dell) Whately, the oldest child with four younger brothers. She grew up in The Beaches, attending Kew Beach Elementary School and Malvern High School. She showed a talent for music from an early age and completed her BMus degree as a French horn player at the University of Toronto. She met her husband Andrew Dawes while a student at U of T, and they married on October 14, 1967. She had two daughters, Debra Louise and Adriana Tiamae (Tammy), and they travelled often as a family, accompanying Andy on tour. Karen was a certified Montessori teacher and taught piano for many years to help support the family. She was loved by her students as a patient and caring teacher with high expectations. Karen and Andy moved to Vancouver, BC in 1992 where Karen developed her skills as a visual artist, with a special talent for watercolours. Her colourful and vibrant art was shown across Western Canada and graces the homes of countless friends and patrons. Karen is predeceased by her parents Ralph and Mary, and her brother David. She will be greatly missed by her husband Andy, her daughters Debra and Adriana/Tammy, her grandchildren Katherine, Kurtis (Debra and Matthew Klymson) and Alexander (Adriana and Leo Comitale), and her brothers Philip, William and James. The family gives heartfelt thanks to the medical professionals who cared for Karen during her final days: the doctors and nurses at the BC Cancer Agency, the nurses of the Vancouver Coastal Health Palliative Care Unit especially Cody, Laura and Jackie, the Red Cross, and Dr. Geoffrey Edwards. A memorial concert celebrating Karen’s life will be held Sunday June 18, 2017, at West Point Grey United Church, 4595 West 8th Avenue, 3:00-5:00pm. The venue is wheelchair accessible, and all are welcome. In lieu of flowers, please make a donation to the charity of your choice that benefits children or animals. Please send an email to karendawes.tributes@gmail.com. You can include pictures, text, or multimedia files and they will be posted here under tributes. Please be sure to sign the email with your name to it so we can list it correctly.